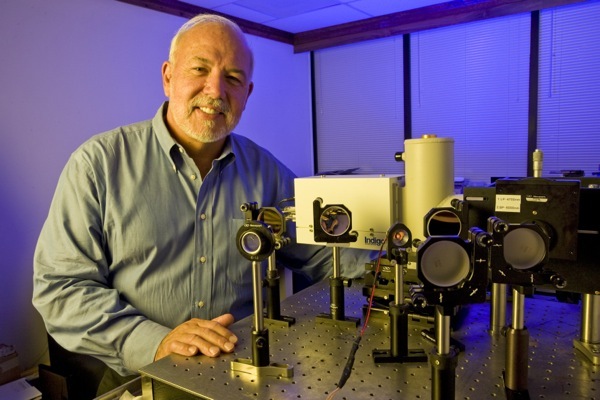 John F. Rabolt has been named a member of the National Academy of Inventors for his groundbreaking work in infrared technology. 8:55 a.m., Feb. 18, 2014--University of Delaware professor John F. Rabolt has been named a member of the National Academy of Inventors. Election to NAI membership is a professional distinction that honors academic inventors for their creative thinking and innovative spirit. Rabolt, the Karl W. and Renate Boër Professor of Materials Science and Engineering (MSEG) and professor of biomedical engineering, was selected for groundbreaking infrared technology developed in his laboratory called planar array infrared (PA-IR) spectroscopy. PA-IR uses a dispersive spectrograph and a focal plane array to study real time events, including Langmuir film compression, liquid crystal reorientation and cyclic elastic deformation of polymer films. Considered the next generation in fast, infrared spectroscopy, PA-IR has influenced medical and environmental systems by enabling critical breakthroughs in the early detection of eye diseases and environmental hazards, among other things. The PA-IR technology has no moving parts, operates equally well in the laboratory and in the field, and can detect chemical agents (solid, liquid or gas) far faster than other current technologies  in milliseconds as opposed to minutes. Rabolt joined UD in 1996 following a successful career as an IBM research scientist. At UD, he led the materials science program to departmental status in 1998 as chairperson of the program. In 2005, with the help of UD’s National Science Foundation EPSCoR program, Rabolt and Bruce Chase, a fellow MSEG faculty member and former DuPont scientist, founded the start-up company PAIR Technologies LLC to commercialize the PA-IR technology. Rabolt is one of three inventors on two patents licensed to PAIR Technologies through UD’s Technology Transfer Center, a division of the University’s Office of Economic Innovation and Partnerships. “Since the day he arrived here to chair the newly formed MSEG department, John has been a primary driving force behind our entrepreneurship enterprise and continues to be an inspiration to both students and faculty alike. He is a true embodiment of the creative, innovative and entrepreneurial spirit of Delaware engineering. We are pleased that he is finally being recognized by the rest of the world,” said Babatunde A. Ogunnaike, dean of the College of Engineering. Rabolt’s current research focuses on electrospinning polymer nanofibers, polymer deformation, investigations of new, environmentally sustainable polymers , PA-IR, Raman and FT-IR spectroscopy of polymers and biomolecular materials for tissue engineering scaffolds. Another 2013 NAI member with ties to UD is Rakesh Agrawal, a member of the chemical engineering faculty at Purdue University who earned his master’s degree in chemical engineering from UD in 1977. The National Academy of Inventors is a 501c3 non-profit organization composed of more than 200 U.S. and international universities and non-profit research institutes, with more than 3,000 individual academic inventor members and growing rapidly. It was founded in 2010 to recognize and encourage inventors with a patent issued from the U.S. Patent and Trademark Office, enhance the visibility of academic technology and innovation, encourage the disclosure of intellectual property, educate and mentor innovative students, and translate the inventions of its members to benefit society.